In applications such as drug delivery or sensing, nanomaterials are often exposed to a multitude of environmental conditions. Thereby nanomaterials and -pores often exhibit a different behavior than bulk materials due to their small dimensions. One example is the pH-value. Based on indirect transport measurements and theoretical studies the “pH” in nanopores is reported to be shifted and pH-transitions to be broadened as compared to bulk solution. 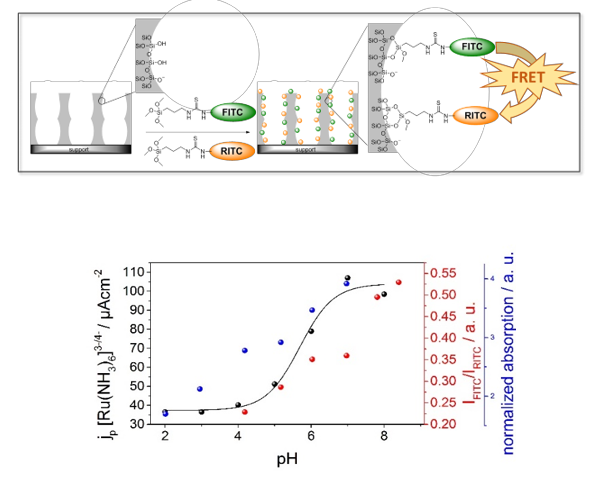 Inspired by pH-detection strategies in cells we aim to get a better understanding on confinement effects on charge transitions and “pH” in nanopores by using e.g. fluorescence dyes for a direct pH-readout. We envision on-line “pH” detection down to single nanopores and potentially single molecule experiments. M. Stanzel, R. Brilmayer, T. Meckel, A. Andrieu-Brunsen, submitted 2018.